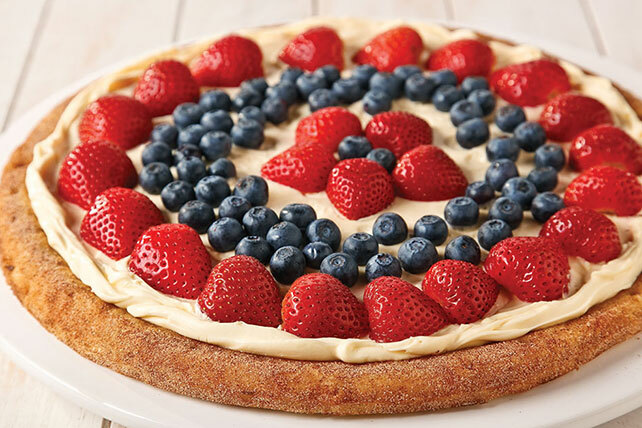 Make a gorgeous bakery-style Simple Fruit Pizza in just 10 minutes of prep. This Simple Fruit Pizza is ready to serve in less than a half hour. Brush crust with butter; sprinkle with cinnamon sugar. Bake 5 to 6 min. or until golden brown; cool 10 min. Spread cheesecake filling onto crust. Arrange berries over filling. Sweets can be part of a balanced diet but choose an appropriate portion. Prepare as directed, using PHILADELPHIA Ready-To-Eat Cheesecake Key Lime and substituting drained canned pineapple tidbits for the blueberries. Sprinkle with toasted BAKER'S ANGEL FLAKE Coconut, if desired.